It's The Brown Velvet Pie! 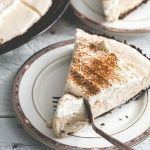 A creamy, boozy, chocolate pie based off the cream cocktail, The Brown Velvet. Preheat oven to 350°F. Break chocolate Graham Crackers into a food processor and blitz until you have crumbs. Slowly drizzle butter into food processor while pulsing, making sure butter is fully incorporated. Pour crumbs into a 9 inch pie pan, pressing firmly into pan to form a crust. Place pie pan in the middle rack of the oven and bake for 10 minutes. While the crust is baking, pour 1/2 cup cold water in a medium saucepan. Add 1/3 cup sugar, salt, and egg yolks. Stir to blend. Heat over low heat and stir until the gelatin dissolves and the mixture thickens (about 2 minutes). DO NOT BOIL. Remove from heat. Stir the triple sec and creme de cacao into the mixture. Chill until it starts to mound slightly when nudged with a spoon (about 15 minutes). Add cream, triple sec, creme de cacao, and powdered sugar to a stand mixer with the whisk attached. Beat on medium high (6 on a Kitchen Aid) and whip until doubled in volume (about 3 minutes). Pour mixture onto the pie and spread with a silicone spatula until covered. Dust with freshly ground cinnamon.